(Photo credit: Ester Lin/Showtime) By Dan Ambrose: ESPN analyst Teddy Atlas sees this Saturday’s fight between WBC junior middleweight champion Saul Alvarez (40-0-1, 29 KO’s) and Josesito Lopez (30-4, 18 KO’s) at the MGM Grand in Las Vegas, Nevada, as being a cut dried case of the 22-year-old Alvarez having simply too much power and size for the welterweight Lopez. However, Atlas doesn’t just think that Alvarez’s power and weight will be major factors in him winning this Saturday. Atlas also points to Alvarez’s boxing skills and speed as being huge factors for him in this fight. I don’t see Alvarez as going after Lopez in a sustained way to try and get him out of there unless Lopez puts a lot of pressure on him. 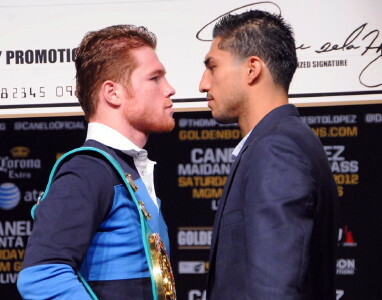 If Lopez angers Alvarez, he’ll motivate Alvarez to try and get Lopez out of there as fast as possible. Alvarez doesn’t like when his opponents go after him and he tends to look to retaliate with huge shots when he gets hit. Lopez is going to be hitting Alvarez a lot in this fight while it lasts, and I imagine this is going to cause Alvarez to want to finish Lopez as quickly as possible.